It's delicious white pasta, packed with nutrition. 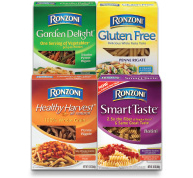 Ronzoni® Smart Taste® has 2.5 times the fiber of regular pasta and is an excellent source of Calcium and Vitamin D. It tastes so good that kids will never know it's healthy. It's delicious, 100% whole grain pasta that has 56g of whole grains per serving... twice as much as the leading whole grain pasta brand. In addition, it's all natural and an excellent source of fiber. The great-tasting pasta that makes perfect pasta meals every time! It's your classic pasta that brings the family together! A unique multigrain blend of white rice, brown rice, corn and quinoa for a delicious white pasta taste the whole family will love. With 3 servings of vegetables in every 3.5oz (100g) portion, Ronzoni SuperGreens™ is a great addition to your family's healthy lifestyle. It’s also a good source of fiber and 5 vitamins and minerals.